It all began at a party in Palm Springs, California in early December 1970. Elvis's reign as the "King of Rock and Roll" had been in decline since the "British Invasion", led by the Beatles, had jolted America's pop music market in 1964. Elvis was still an American idol and had begun a comeback in his singing career. However, his energies in recent years had been devoted to making a series of forgettable Hollywood films. In a conversation with Vice President Agnew at the party, Elvis expressed his concern for what he felt were threats to American culture posed by, not only the British Invasion, but also the drug culture, the radical SDS, the hippies and the Black Panthers. Elvis wanted to do something about it. Three weeks later, Elvis, accompanied by two body guards, was bound for Washington, DC aboard an American Airlines flight. He spent his time writing a letter to the President. Beginning "Dear Mr. President, First, I would like to introduce myself. I am Elvis Presley. . ." the rock star expressed his desire to be made a "Federal Agent at Large" in order to communicate with and report on what he felt were deleterious factions threatening America. He believed his star-status would allow him a non-threatening entrance into the closed environment of these groups. A federal law appointment would give him credibility. Elvis arrived at the White House gate on the morning of December 21 with his two body guards. He carried some family photos and a commemorative World War II .45 caliber pistol intended as gifts for the President. He handed his letter to the guards and waited. Elvis's arrival ignited a flurry of activity among the White House staff. White House aide Dwight Chapman sent a quick memo to his boss, Chief of Staff H.R. Haldeman. 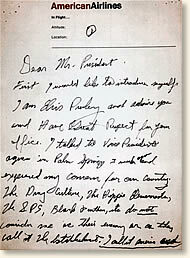 Chapman attached Elvis's letter and advised that the President meet with the rock star. Haldeman concurred and Elvis was scheduled to meet with Nixon at 12:30 that afternoon. "He wanted to restore some respect for the flag. . . ."
"The meeting opened with pictures taken of the President and Elvis Presley. Presley immediately began showing the President his law enforcement paraphernalia including badges from police departments in California, Colorado and Tennessee. Presley indicated that he had been playing Las Vegas and the President indicated that he was aware of how difficult it is to perform in Las Vegas. The President mentioned that he thought Presley could reach young people, and that it was important for Presley to retain his credibility. Presley responded that he did his thing by singing. He said he could not get to the kids if he made a speech on stage, that he had to reach them in his own way. The President nodded agreement. Presley indicated that he thought the Beatles had been a real force for anti-American spirit. He said that the Beatles came to this country, made their money, and then returned to England where they promoted an anti-American theme. The President nodded in agreement and expressed some surprise. The President then indicated that those who use drugs are also those in the vanguard of anti-American protest. Violence, drug usage, dissent, protest all seem to merge in generally the same group of young people. Presley indicated to the President in a very emotional manner that he was 'on your side.' Presley kept repeating that he wanted to be helpful, that he wanted to restore some respect for the flag which was being lost. He mentioned that he was just a poor boy from Tennessee who had gotten a lot from his country, which in some way he wanted to repay. He also mentioned that he is studying Communist brainwashing and the drug culture for over ten years. He mentioned that he knew a lot about this and was accepted by the hippies. He said he could go right into a group of young people or hippies and be accepted which he felt could be helpful to him in his drug drive. The President indicated again his concern that Presley retain his credibility. At the conclusion of the meeting, Presley again told the President how much he supported him, and then in a surprising, spontaneous gesture, put his left arm around the President and hugged him. In going out, Presley asked the President if he would see his two associates. The President agreed and they came over and shook hands with the President briefly. At this meeting, the President thanked them for their efforts and again mentioned his concern for Presley's credibility." 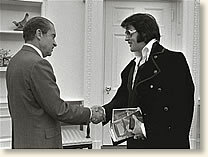 "President Nixon Meets Elvis, 1970" EyeWitness to History, www.eyewitnesstohistory.com (2007). A few weeks after the meeting, Elvis was awarded a specially made badge from the Bureau of Narcotic and Dangerous Drugs.